Space is not "out there somewhere." We are in the midst of it. We are a part of it... From the physical world around us to the smallest cells within, we are interwoven into one vast, living ocean of consciousness. For 25 years, the Hubble space telescope (which marks its anniversary on April 24) has given us incredible visual access to the cosmos and the mysteries of the universe. 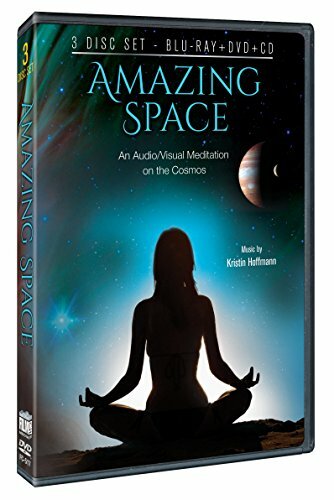 Now armchair adventurers can embark on a breath-taking, spiritual journey through space - which will both entertain and calm you - with the powerful, meditative, audio-visual experience Amazing Space , a three-disc (Blu-ray/DVD/CD) collector's set available May 26 from Film Chest Media Group. An incredible companion & guide to meditation, yoga, dance, dreaming, or just relaxing, Amazing Space will gently lift you from your fast-paced life on Earth into the colorful, floating bliss of the cosmos - where you will enjoy the peaceful, awe-inspiring splendor of space while meditating on the vastness, significance and mysteries of the universe - with imagery from the actual Hubble space telescope. Your spirit will soar directly into magnificent star clusters, nebulas and galaxies. Accompanying the stunning, hour-long visuals is an original soundtrack, featuring the powerful, ethereal music of renaissance pop songstress and Juilliard-trained, multi-instrumentalist Kristin Hoffmann (Unfolding Secrets: A Symphony of the Heart; The Human Compass; Bella Gaia, an immersive, multi-media experience created in conjunction with NASA). Through Hoffmann's carefully constructed and timed score, the viewer is able to peacefully travel deep into space, carried along by the hypnotic sounds of piano, strings, wind instruments, cello and vocals. With a strong sense of artistic altruism, Hoffmann is most passionate about projects that explore music's healing power and allow listeners to tap into their higher potentials. The critically acclaimed Hoffmann has also penned songs for such hit shows as Dawson's Creek, The Young and the Restless and Palmetto Pointe and has shared the stage with such popular groups as The Wallflowers, Feist and Brandi Carlile. Wrote the Village Voice about the songstress, "Hoffmann is a talented, young singer with a great voice" Added Infinite Shift, "Kristin Hoffmann's soaring vocals will captivate your heart and draw you into a musical journey." Amazing Space is presented in widescreen with an aspect ratio of 16 x 9 and original soundtrack. Special features include an informational pamphlet and interviews with the composer, editor and producer. Visit http://www.AmazingSpaceMovie.com to view the trailer, learn more about the creators and find information on upcoming screenings/events. Founded in 2001, Film Chest offers high-quality content for a wide variety of production and distribution needs, boasting one of the world's largest libraries (10,000+ hours) of classic feature films, television, foreign imports, documentaries, special interest and audio much of it restored and digitized in HD. Headquartered in Bridgeport, Conn., with offices in New York City, the company also produces and distributes collector's DVD sets for its American Pop Classics, CULTRA and HD Cinema Classics labels. Visit online: http://www.filmchest.com/ www.filmchestmediagroup.com.